Did you know that that 70% of all firefighters in the country are volunteers or that 100% of the men and women that serve as firefighters for Medina are volunteers? Did you know that they also respond to calls for emergency medicals, rescues and hazardous material situations? The men and women of the Hamel fire Department, which serves 75% of Medina, are ordinary people from the local community. They have jobs, raise families and do all the other activities you do. However, when the call for help comes, these same people transform into firefighters/medical first responders and come together as a team to do extraordinary things! Bonded by a passion and a commitment to serve, they train, prepare and make ready to stand in harm’s way to protect the community … sacrificing their time, efforts and energy in the service of others. It’s not done for pay, recognition or notoriety...but rather for the personal satisfaction of helping someone in a time of need. Don’t be confused by the label “volunteer”... they train to the same level and face the same risks as full-time firefighters. They are the .4% of the population, fueled by the need to serve, that earn the title “Firefighter”! Hamel Fire is always looking for new members. You don’t need special skills, you don’t need to be strong, you don’t need to be young … there is a role for everyone! Would you answer “YES” to any of these questions? Do YOU want to do something important for the community? Do YOU want to take on new challenges and push yourself to new limits? Do YOU want to learn new skills? Do YOU want to be part of a high-performing team? Do YOU want to be part of the “.4% club”? Do YOU want to have an impact? If you answered YES to any of these, so, we have a great opportunity for you .... fill out an application and find out how you can help! How Much Time Does it Take to Become a Firefighter? There is some variation, but in general the time required for those core courses is about 160-180 hours of classroom time. Classes are generally done in the evenings in local fire departments,meeting 2 times a week. New members are expected to completed this training in the first 2 years as a members, but most attack it and complete it within the first 6 months. While we want to get everyone trained and productive as quickly as possible, we recognize there are limits to schedules and make our best efforts to accommodate everyone, within reason. Who Does the Hamel Volunteer Fire Department Serve and What do they do? Currently the Hamel Fire Department operates under contract with the City of Medina. It provides coverage for about 75% of the residents and property in the city, protecting more than 5,000 residents and $1,200,000,000 worth of property. As Medina grows, so does the responsibility of the Department. Geographically the Department generally covers the area of Medina from County Road 101 in the east, to Willow Drive in the west, County Road 47 to the north and County Road 24 to the south. 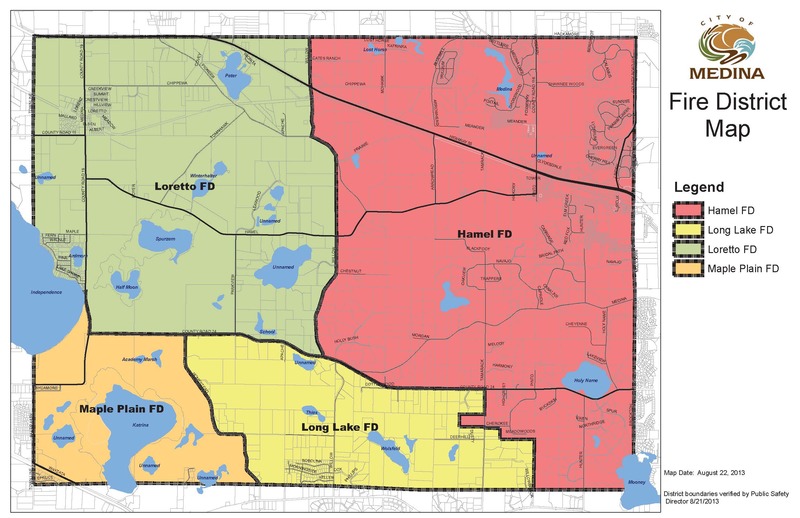 The coverage for the remaining 25% of Medina is split between Long Lake FIre, Maple Plain Fire and Loretto Fire. The Department responds to between 180 and 200 calls annually. These include fires, hazardous material incidents, emergency medical, rescue, good service and server weather incidents. What Does it Take to Join the Hamel Fire Department? What is the ongoing time commitment for members? What is the Hamel Volunteer Fire Department? The Hamel Volunteer Fire Department is a not-for-profit, private corporation that provides emergency fire and medical services to the City of Medina. Our mission is the protection and preservation of the lives and property of the people it serves. The members of the Department are men and women from the community that have a passion for service! Members of the Department are considered "paid on call" which means that the receive pay for responding to calls and attending training. Additionally, after 5 years of service, members begin vesting in small pension plan. While appreciate , these benefits are not the driving force behind the energy of the Department ... but rather it is the passion to serve the community that fuels our efforts! The fire station is not staffed and there are no sleeping quarters. When a call for service comes in, members who are available respond to the station and staff the apparatus. In that sense, responding to a call is still "voluntary". Some members have more availability during the day, others in the evening. Everyone has a place and something to offer.